This cake is based on a round 4 tier cake, that the bride got out of a magazine. I really wished it could have been round, as it would have been a lot softer. Anyway, gumpaste everything except for the ferns on the sides which are made of royal icing and the dirt which is greated chocolate. 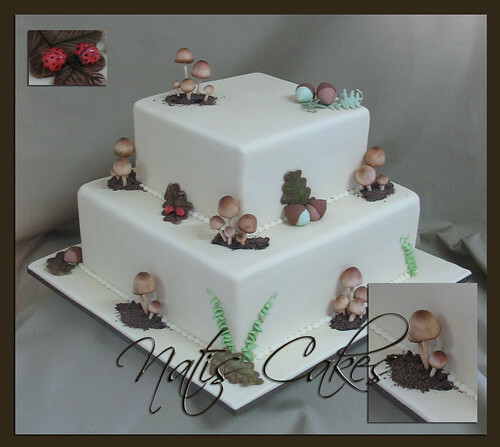 The mushrooms stems are gumpaste covered toothpicks, which were stuck straight into the cake. The cake is vanilla buttercake filled with white choc ganache.